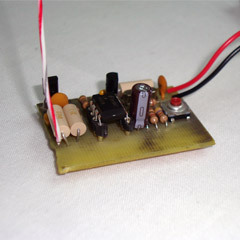 A Simple Pyro RF Transmitter (27 MHz) was very nice of you to implemented, but in fact we are very interested to expand this project for our students within 3-5 miles as an experiment. I am Physicist with valuable information on electronic with transceivers. Can you help? Hi, I am a final year student at the University of the West Indies Trinidad. I would like to use this design to construct a 125 KHz transmitter and receiver, is there any addition or adjustment to this design other than the crystal oscillator? hi, I’m final year student from UTM,Malaysia. Where can I find the schematic diagram. I hope someone still checks this, but if I use a crystal of a lower or higher frequency, will the circuit still work? Or do the resistor and capacitor values need to be adjusted? I’m curious if it has to be 27Mhz or can I make this in a different frequency. Hi,I read your new stuff named “Simple 27 MHz RF Transmitter | PyroElectro – News, Projects & Tutorials” like every week.Your writing style is witty, keep it up! And you can look our website about powerful love spells.